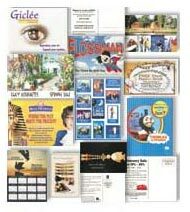 Top Of The Line Printing and Graphics Service in San Diego, California, offers you a wide variety of options for your print projects. Whether you are starting from scratch and need a graphic designer to design your business cards, presentation folders, color brochures, business stationary, invitations, postcards, flyers, and more or your files are ready for print and you are looking for a reliable San Diego printing company with complete finishing and bindery services, we've got you covered. We are also proud to offer San Diego Top Of The Line solutions for printing business checks, labels, custom folders, envelopes, die cutting, embossing, foil stamping, and specialty projects, all available in 1 and 2 color offset and 4 color process printing. To provide a convenient printing and copying service for everyone in the San Diego area is one of our Top priorities. We provide instantaneous online printing estimates, and you can upload your print files via FTP on our web site or via e-mail. We can even come to you and pick up your printing files if you prefer. You have the option to confirm proofs by email, color proof, or by fax. Your finished print project can be picked up in person, we can deliver or ship directly to your office. So no matter how intricate or simple your printing needs are, feel free to give us a call or send us an email and we will be happy to answer any printing questions you may have and give you a free quote. We are looking forward to providing you with our Top Of The Line Printing and Graphics Service.